Create Project Vision—In this Scrum processes, the overarching selection team reviews the Project Business Case to create a Project Vision Statement that serves as the inspiration and provides focus for the entire project. The team identifies the Product Owner. Form Scrum Team—In this process, the selection team creates the Scrum Team. Normally the Product Owner selects the team members, but often does so in collaboration with the Scrum Master. Develop Epic(s)—In this process, the Project Vision Statement serves as the basis for developing Epics. User Group Meetings may be held to discuss appropriate Epics. Create Prioritized Product Backlog—In this process, the Scrum team refines, elaborates, and then prioritizes and creates a Prioritized Product Backlog for the project Epic(s). The team establishes the Done Criteria at this point. 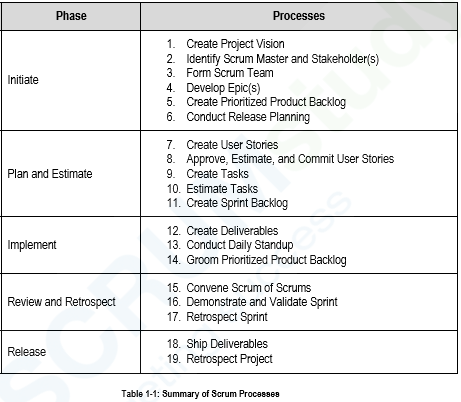 Conduct Release Planning—In this process, the Scrum Core Team reviews the User Stories in the Prioritized Product Backlog to develop a Release Planning Schedule, which is essentially a phased deployment schedule that can be shared with the project stakeholders. Length of Sprint is also determined in this process. Create User Stories—In this Scrum processes, the team creates User Stories and their related User Story Acceptance Criteria. The Product Owner usually writes the User Stories design them. This clearly depicts the customer’s requirements and makes them fully understood by all stakeholders. User Story Writing Exercises may be held which involves Scrum Team members creating the User Stories. The team incorporates the User Stories into the Prioritized Product Backlog. Approve, Estimate, and Commit User Stories—In this process, the Product Owner approves User Stories for a Sprint. Then, the Scrum Master and Scrum Team estimate the effort required to develop the functionality described in each User Story. The Scrum Team commits to deliver the customer requirements in the form of Approved, Estimated, and Committed User Stories. Create Tasks—In this process, the team breaks down the Approved, Estimated, and Committed User Stories into specific tasks and compiles them into a Task List. Often, the team holds a Task Planning Meeting for this purpose. Estimate Tasks—In this process, the Scrum Core Team, in Task Estimation Meetings, estimate the effort required to accomplish each task in the Task List. Here, they create an Effort Estimated Task List. Create Sprint Backlog—In this process, the Scrum Core Team holds Sprint Planning Meetings where the group creates a Sprint Backlog containing all tasks to be completed in the Sprint. Create Deliverables—In this process, the Scrum Team works on the tasks in the Sprint Backlog to create the Sprint Deliverables. The team uses a Scrumboard to track the work and activities. Issues or problems faced by the Scrum Team could be updated in an Impediment Log. Conduct Daily Standup—In this Scrum processes, everyday, the team conducts a highly focused Time-boxed meeting, also referred to as the Daily Standup Meeting. Here, the Scrum Team updates each other on their progress and any impediments they may be facing. Groom Prioritized Product Backlog—In this process, the team continuously update and maintain the Prioritized Product Backlog. The team may hold a Prioritized Product Backlog Review Meeting. In this meeting the team discusses any changes or updates to the backlog and then incorporate them into the Prioritized Product Backlog as appropriate. Convene Scrum of Scrums—In this process, the Scrum Team representatives convene for Scrum of Scrums (SoS) Meetings in predetermined intervals or whenever required to collaborate and track their respective progress, impediments, and dependencies across teams. This is relevant only for large projects where multiple Scrum Teams are involved. Demonstrate and Validate Sprint—In this process, the Scrum Team demonstrates the Sprint Deliverables to the Product Owner and relevant stakeholders in a Sprint Review Meeting. This meeting secures approval and acceptance from the Product Owner for the Sprint Deliverables. Retrospect Sprint—In this process, the Scrum Master and Scrum Team meet to discuss the lessons learned throughout the Sprint. The team documents this information as lessons learned which can then be applied to future Sprints. Often, as a result of this discussion, there may be Agreed Actionable Improvements or Updated Scrum Guidance Body Recommendations. Ship Deliverables—In this process, the team delivers or transitions to the relevant stakeholders the Accepted Deliverables. A formal Working Deliverables Agreement documents the successful completion of the Sprint. Retrospect Project—In this process, which completes the project, the organizational stakeholders and Scrum Core Team members assemble to retrospect the project and identify, document, and internalize the lessons learned. Often, these lessons lead to the documentation of Agreed Actionable Improvements, to be implemented in future projects. 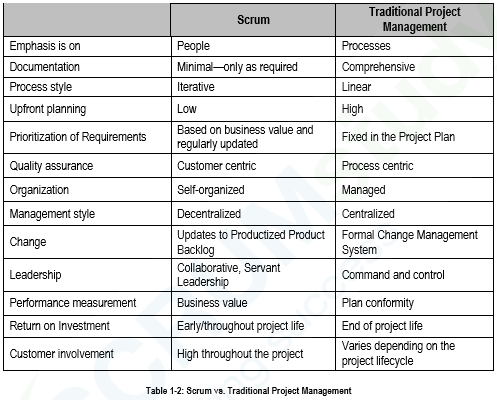 The below table summarizes many of the differences between Scrum and traditional project management models. Article written by our partner VMEDu. Article edited and posted by Quality Assurance Solutions.